Yesterday on QUILTsocial I showed you how to use one of the Disney embroidery designs included in THE Dream Machine 2 from Brother to embellish a store bought child’s t-shirt. Mickey and Minnie decorating the Christmas tree are just too cute!! Today I’m showing you how to upload embroidery designs to create a warm and lovely felted wool cushion. 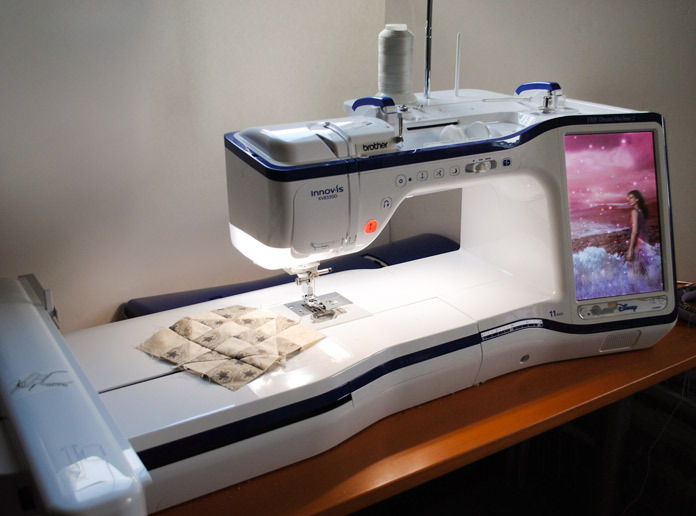 THE Dream Machine 2 comes with SO many embroidery designs, but sometimes you’ll want something specific that isn’t included. When that happens it’s the internet to the rescue!! 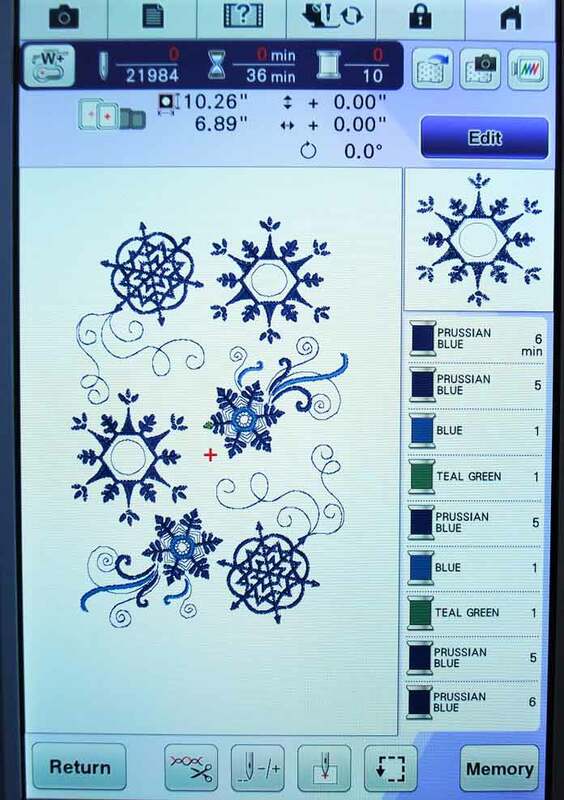 I was blown away when I started looking for snowflake embroidery designs online! 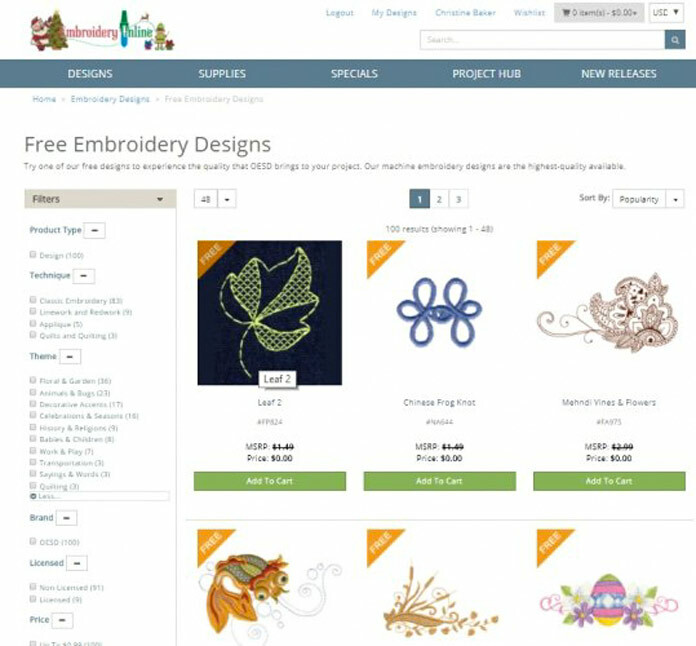 It seems like there are an infinite number of embroidery designs available to purchase and download and there are also many that you can download for free! 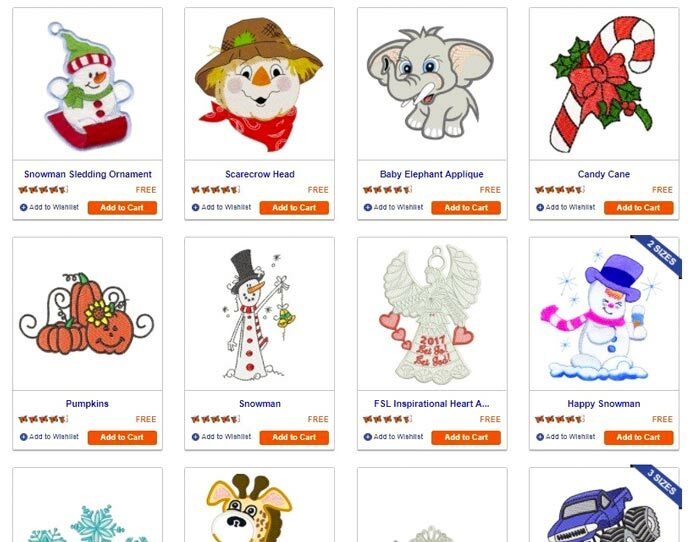 I found a couple websites with a large assortment of free and inexpensive embroidery designs. Here are some of the free designs that are available to download on www.embroiderydesigns.com. Another website with tons of designs is www.embroideryonline.com. For each of the websites, after you checkout, the website will ask you what format your machine prefers. For THE Dream Machine 2 you can use any files that are formatted as .pes, .pha, .phb, .phc, and .dst. Once I found the designs I wanted and downloaded them in the correct format, I saved them on a USB stick. 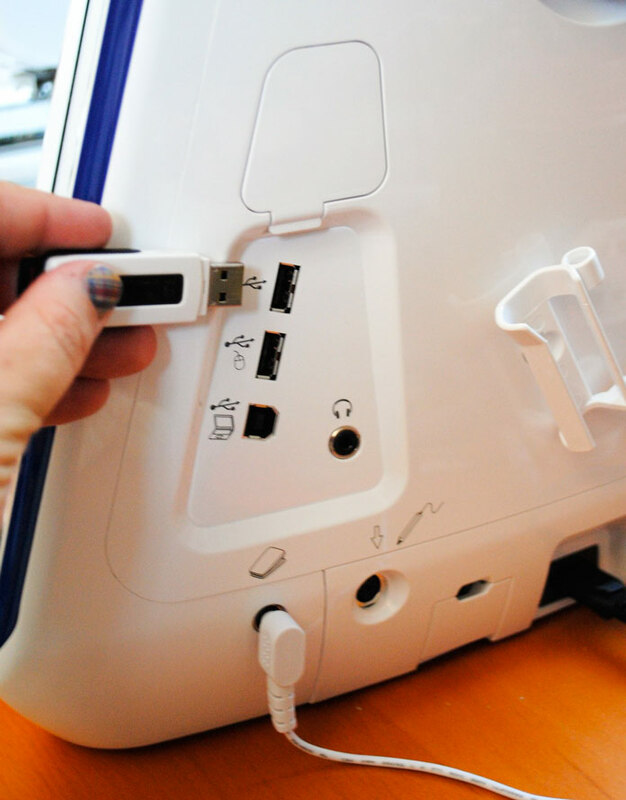 Next I inserted my USB stick into the USB drive which is located on the right side of THE Dream Machine 2. 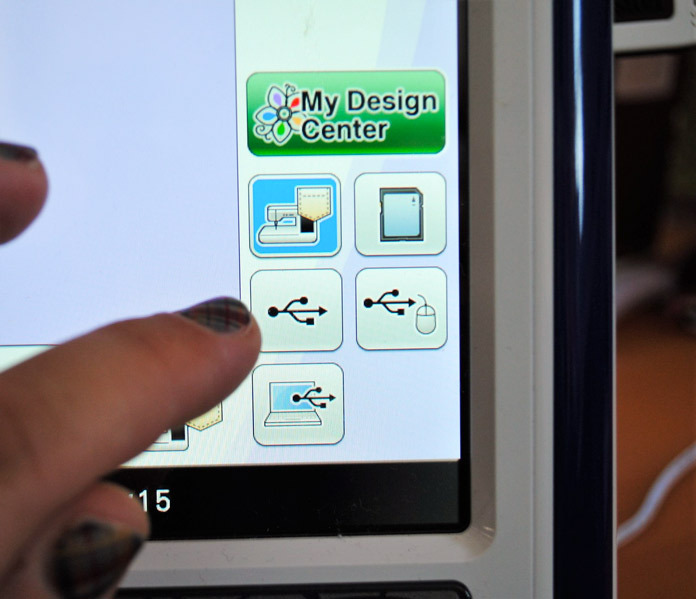 On the embroidery design screen I selected add and then memory. 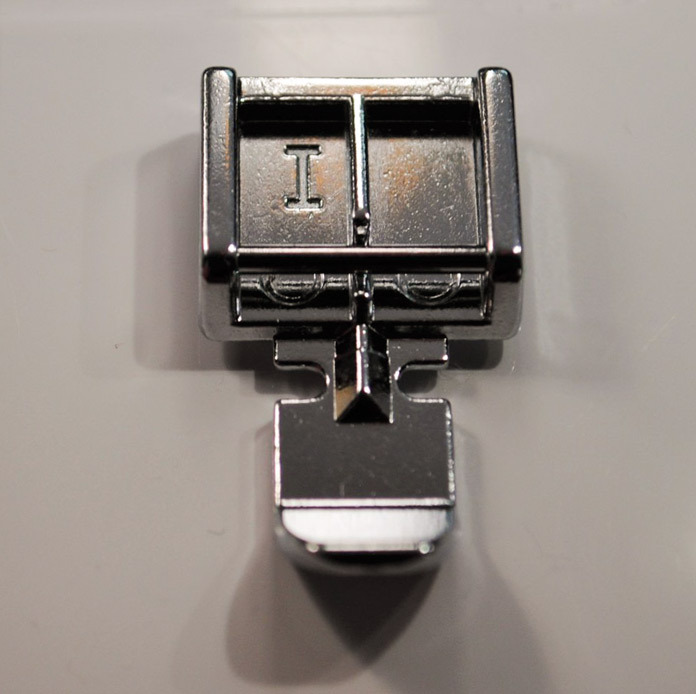 Next, the USB key is selected to access embroidery design files which are saved on the USB stick. As you can see, I found LOTS of designs to download! 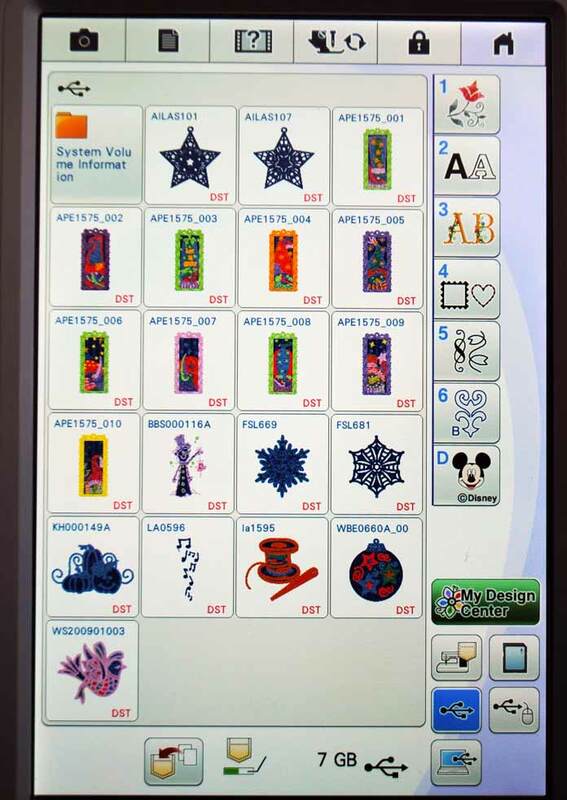 Here the LCD screen shows images of the embroidery designs that I saved on the USB stick. 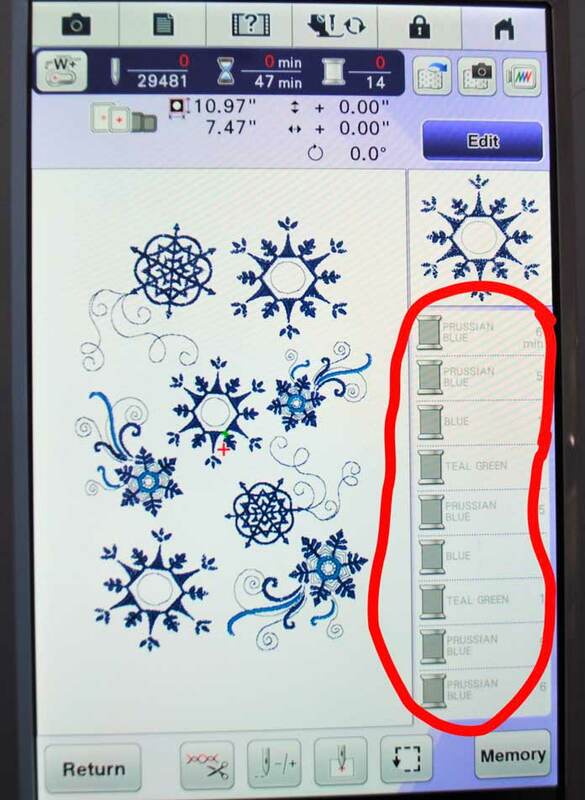 I selected each of the individual snowflake designs I downloaded and added each of them to the screen. In order to rotate or resize them I pressed the Edit button and then selected the appropriate icon on the edit screen. This allowed me to fill in the area of the embroidery hoop I selected. I cut a piece of cream colored felted wool and ironed the SULKY Totally Stable stabilizer onto the back. I loaded it into the embroidery hoop and attached it to the arm of the embroidery unit. Since I’m using a variegated thread to stitch all of the snowflakes, I clicked on the edit button and then selected the uninterrupted embroidery key. 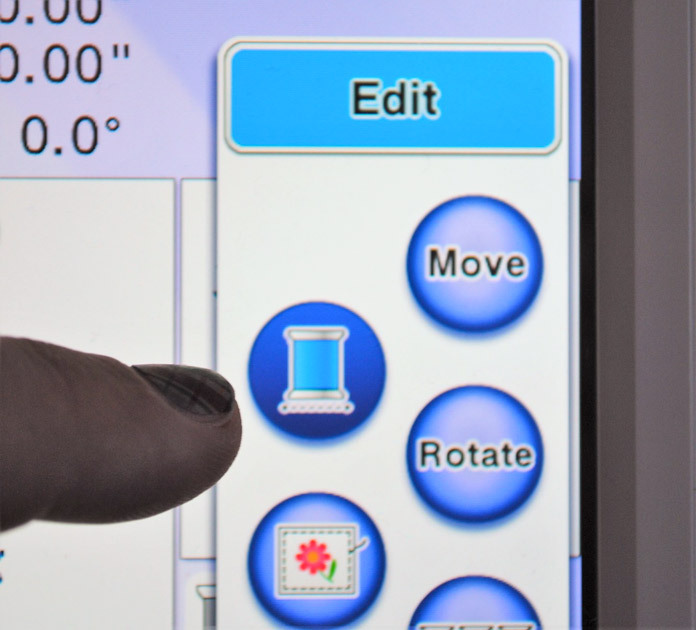 When pressed, this button tells the machine to embroider the whole design in one color of thread without stopping to tell you to change the thread to the next color. The thread color chart is grayed out to show that the whole embroidery will be stitched in a single color. 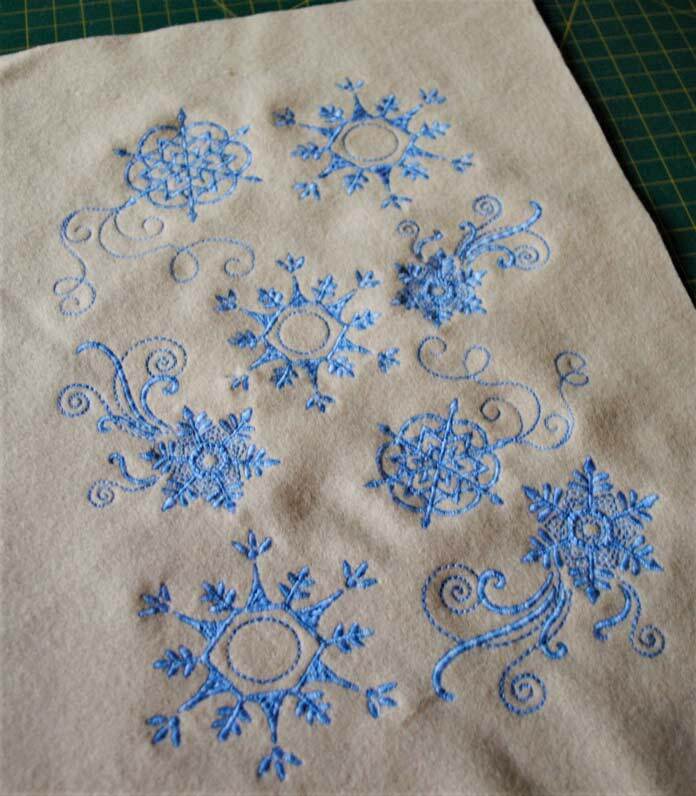 Here’s the finished snowflake embroidery stitched on felted wool by THE Dream Machine 2. The next step is to trim the wool to a rectangular shape and to cut a piece of cotton this same size for the back of the cushion. The front and back of the embroidered cushion are then pinned with right sides together. 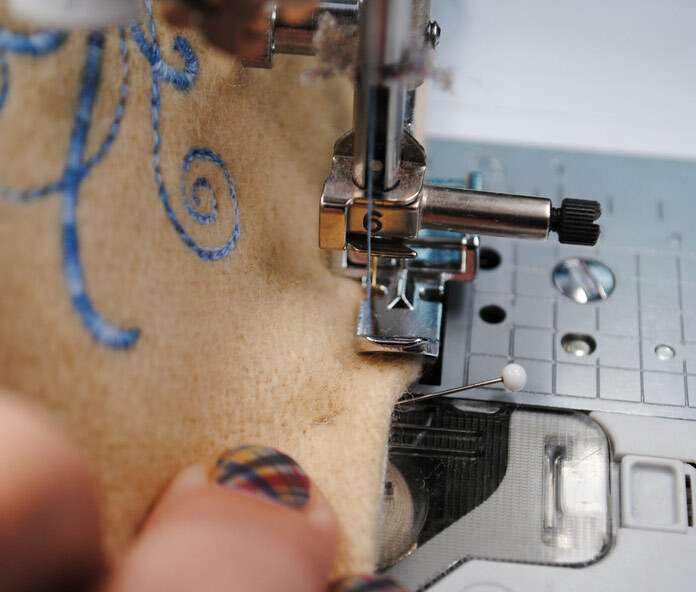 Sew around all four sides of the cushion, leaving an opening about 4″ long for turning. I rounded the corners of my cushion and then clipped the inside seams along the curve, but you can sew the cushion with square corners too. Next, I turned the cushion right side out and selected the zipper foot for machine. I stuffed the cushion with Premium Fiber Fill and then pinned the opening closed. Next I sewed around the entire edge of the cushion to close the turning hole and to give the edge a more decorative look. Here’s the completed felted wool cushion embroidered using THE Dream Machine 2 from Brother. 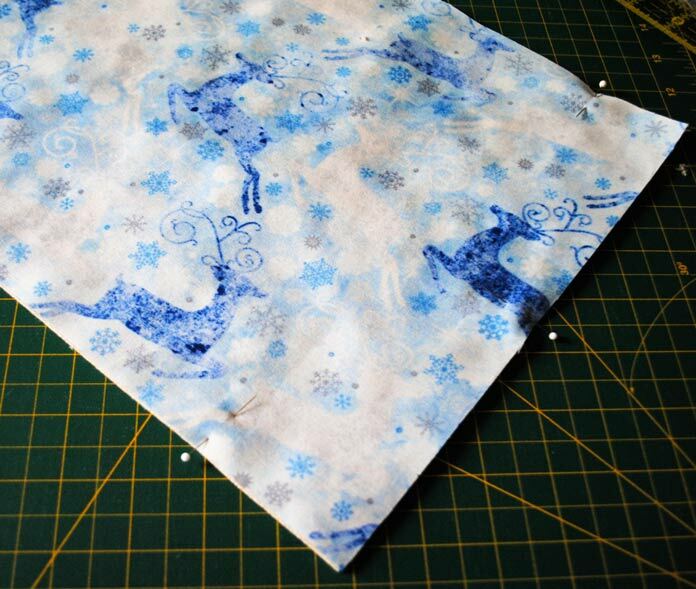 You could use this same technique to make any size of cushion, or even a little pincushion! 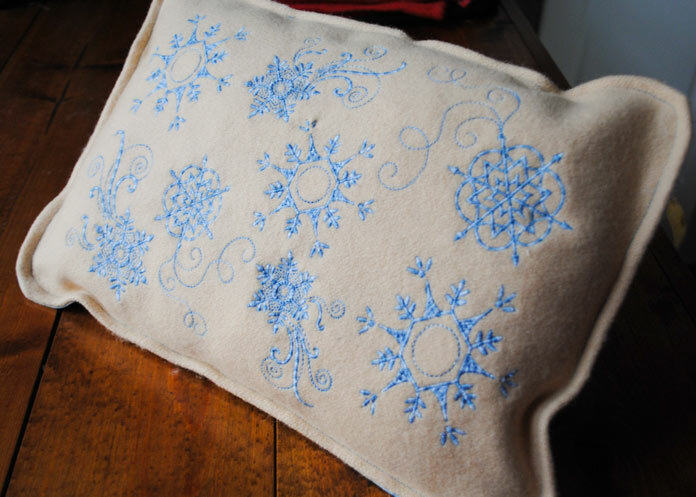 The wool gives the cushion a nice sturdy finish and is a lovely background for the beautiful embroidery! Tomorrow on QUILTsocial I’ll explore more of the great Disney embroidery designs included with THE Dream Machine 2 to find just the right one to make a personalized gift for a new baby. Join me! 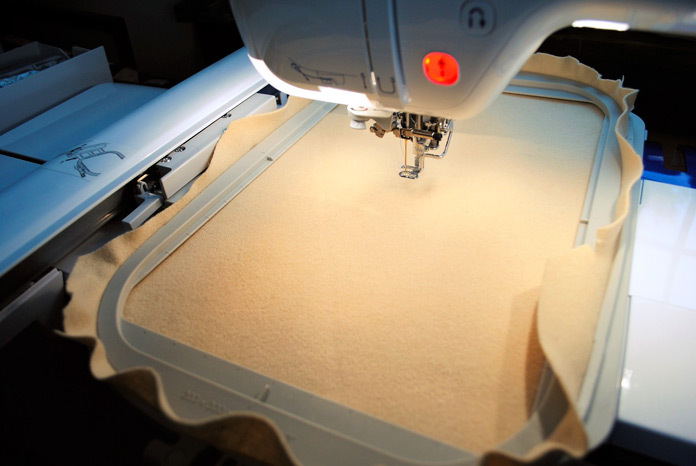 Go back to part 2: How to successfully machine embroider on a t-shirt in no time flat! How to successfully machine embroider on a t-shirt in no time flat!